Landing an interview can be a challenge and if you are starting to feel like your resume is being overlooked, there might be some things you are unwittingly doing wrong that are keeping employers from wanting to hire you. Below you will find 10 suggested ways to help build a solid resume that will keep you as a strong contender for job opportunities and hopefully help you secure an interview. Rid your resume of unprofessional fonts. While it is a good idea to make your resume unique, unprofessional fonts like Comic Sans, Helvetica, and Arial, sometimes annoy and turn off potential hiring teams. It may sound silly if you do not deal in the world of design, but the typeface is an important component for any document. Instead of using commonplace font, do some research and opt for something more aesthetically pleasing and resume-appropriate. Include relevant work experience and use plosive verbs. Maybe you’ve worked in the same job for many years and while this is quite a feat and worthy of mention, you don’t necessarily want to simply say, “worked” on your resume. Instead, use a variety of verbs when discussing your experiences; consider verbs like “supervised,” “evaluated,” or something even more measurable like “produced.” If you Google “Bloom’s taxonomy wheel,” you can find a lot of descriptive verbs to help showcase your talent and experiences on your resume. Relevant experience should trump chronology. If you have been out of work for any amount of time, or have an unconventional work history, writing a traditional, chronological resume may not work. Or, maybe you have been working, but the work is not necessarily relevant to the job you are applying for. An experiential resume can be a great solution to either of these scenarios. To set up an experience-focused resume, think about the various work you have done in different positions (supervising, close attention to detail, quality control, etc.) and begin to outline your resume in a format that highlights your skills in advance and more prominently than the name and duration of previous jobs. Be open to opportunities. On your resume, you will want to highlight your potential to grow. This can be done by showcasing your ability to step outside of your comfort zone. For example, maybe you have worked a variety of shift throughout your work-life; it would be beneficial to you if you can highlight that you are willing to work in various positions at various times. Focus on your specific experience. In your cover letter or interview it will be a good idea to discuss the advantages that you are looking forward to at whichever company you may be applying to, but on your resume, you want to focus on what you can bring to a company, rather than on the employer. Be consistent. Attention to detail on your resume is vital. As you capitalize, bold, bullet or number things, make sure you are being consistent. In the world of resumes, scan-ability is very important. If the right-hand side is filled with which space, it may seem like you don’t have as much experience as you really do. Use appropriate highlighting and bolding to help fill your resume and make it a scannable document. Proofread. Have a friend, spouse, or colleague look over your resume. Typos or poor grammar can really hurt an otherwise stellar resume. You don’t want a potential boss to toss your resume to the slush pile just because you mistakenly misspelled the word “experience” and overlooked it. Don’t send out the same resume to 50+ companies. Instead, curtail your resume specifically to each place or position you are applying to. If you are writing an experiential resume, for example, you will want to highlight items that pertain specifically to the requirements of a particular position. This is helpful if you are applying to multiple positions within the same company. Consider your resume from the reader’s perspective. If you have worked in the same position for a long time, you will want to consider clarifying your experience and expertise. You want to ensure that a potential employer knows you are teachable and trainable. Make it clear that you are open to growth and learning by highlighting ways in your current position that you have been flexible. For example, it can be helpful to discuss ways you have been involved with group cooperation. Or, it might be beneficial to highlight various achievements in your job along the way. Don’t over-embellish your experiences or achievements. You want to be honest and authentic on your resume, always. 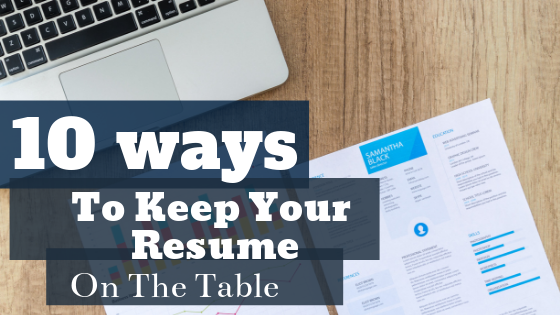 Even if you are worried that your resume is not chocked full of relevant experiences, you don’t want to inadvertently end up in a position you are not actually qualified for. When creating your resume truthful, and specific as possible.